We actually do get some painting done on occasion. Back in Now THAT’S a Tank! we looked at the Khurasan 15mm Advanced Superheavy Grav Tank. 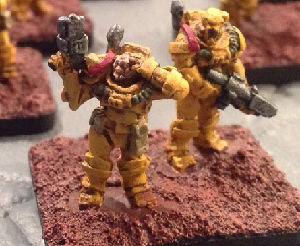 In some of the pictures for comparison were the Khurasan Mid-Tech Humans in Power Armor troops. Well we finally got around to getting the troops painted. The tank is almost done. The bases we used are custom Litko 3mm plywood bases. For 15mm sci-fi we take the approach that in the future troop unit sizes are smaller and forces more nimble. So having smaller bases with fewer troops makes sense. Individual figures at 15mm seem a bit too fiddly so this approach strikes a good balance. Moreover the bases can be used at skirmish to represent the 1-3 troops on the base or at larger scales could be a fire team, squad or even an entire platoon. For higher tech forces we go with 1″ x 1 1/4″ for command and some support units (this is the ‘small’ Flames of War base size) and troops and other support units we put on 1″ x 1 1/2″ bases. For horde type troops we put them on 2″ x 1 1/4″ bases (Flames of War ‘medium’ bases). For powered armor troops we go with two troops per base (unless they are very large) and two on command bases. For more mid-tech armor troops we go with three or even four figures per base. Hordes are three or more per base depending on the size of the figure. We have found this basing system works well across a number of rule systems including Gruntz, Strike Legion, Quadrant 13 and Hammer’s Slammers. The paint job we did is Imperial Fist inspired. The figures have enough detail that they paint up easily and details are easy to pick out without being overwhelming. While Khurasan calls them ‘mid-tech’ troops they fit the traditional power armor mold very well and have just enough bulk to be larger than ‘normal’ troops without being overly large. We think they mix well with other lines. The basing scheme is supposed to be sort of a Mars-ish barren effect. We may add something to them later because they are perhaps a bit too stark but work fine for now. As you can see in the photos our basing sizes also work well with the Spaceship-X tiles for corridor battles. You can also see something new we tried. For the Khurasan Aliens we wanted that ‘horde stream’ feeling and so based the Aliens on the base the long way. This gives the units some depth. The hammerhead Aliens are a bit smaller than the regular Aliens so we left them on our normal bases to represent that they would fill a more scouting/infiltrating role and are perhaps harder to hit but weaker units. This entry was posted in 15mm, Miniature Wargames, Painting, Sci-Fi. It’s your choice but I warn you not to underestimate my powers. Ok, well maybe we underestimated Russ just a bit! Just a few weeks after our first look at Dust Warfare we’ve had something of an about face. We liked the rules from the start but had said we had sworn off 28mm gaming. Well, ok, maybe not. After actually playing a game and seeing the Premium Edition of the models we got sucked in. The reasons for our change of heart came about from a variety of factors. First of all, while we liked the rules after first looking at them, we really like them after playing a game. We won’t go quite as far as Russ by saying they are ‘the best army-scale rules ever’ but they are very elegant, fast playing, and provide just that right amount of tactical flavor and decision making to produce a fun and challenging game. You will pick up the basics of play very quickly and after just a game or two will be focused on tactics not trying to remember rules. 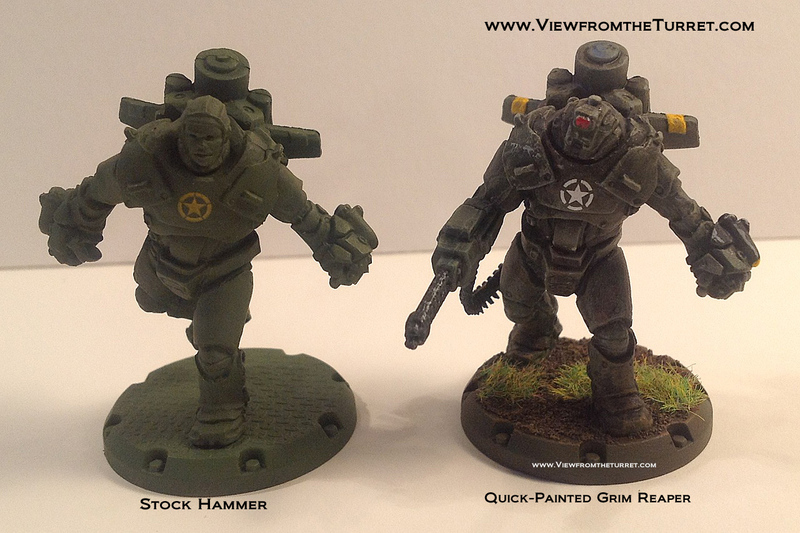 On the left is the stock, out-of-the-box Assault Squad figure and on the right is a quick-painted Attack Squad figure. The entire Attack Squad was painted in just a couple hours. The second reason is the models themselves combined with the units needed for the game. 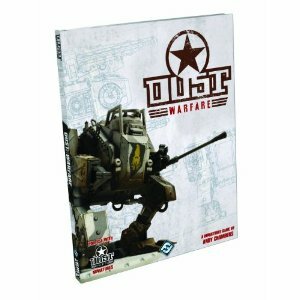 Like most sci-fi miniature games Dust Warfare uses a points system for force building. A small game is under 200 APs and a medium game is around 300 APs. A small game will have one or two platoons and a medium game probably at least two platoons. What is nice about Dust Warfare is that a small game is still a lot of fun and has a low model count. A squad is generally only 3-5 figures not 10-20 like other games. A 150-200 AP force will only have about four infantry squads and one or two walkers. Thus at most you are probably looking at twenty figures or so and one or two vehicles to get started. This is extremely manageable both from a painting and a cost perspective. It is then an easy task to build up from there over time. Combine this with the pre-assembled and pre-primed nature of the miniatures and you can be playing faster than almost any other miniatures game out there. This fact combined with the great rules is a real winner. On the left is the stock Premium Edition Allied Heavy Ranger Officer figure (with base painted by myself) next to a quick-painted Grim Reaper figure. Another reason, related to the above issue with the miniatures, is also the fact that you can get the Premium Edition models or simply quick-paint your figures. The Premium Edition figures are very well done. They are not cheap but they are about the same cost as a unit of 40K infantry that come un-assembled and un-painted. Thus with a combination of a couple of Premium units and some quick painting you can get your basic starting force on the table, fully-painted, in literally a weekend or two. Included here are some examples of the basic miniatures, the Premium models, and our quick painted models. We couldn’t quite bring ourselves to do Russ’ 10 minute paint job but with just a few hours of attention the Dust minis look great. 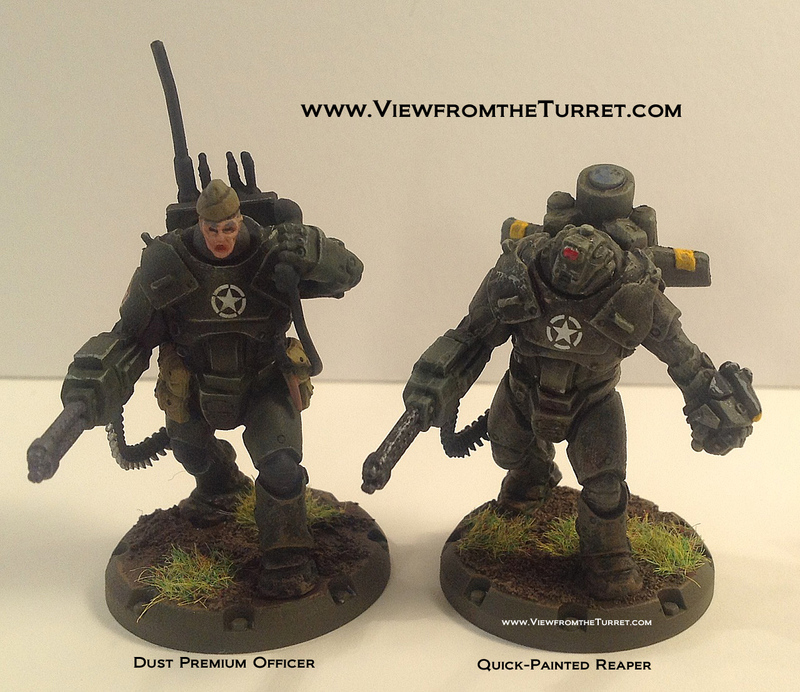 In the front are our own quick painted Reapers with the Premium Edition Heavy Command Squad units in the back. We did texture and paint the Premium bases but that was all. 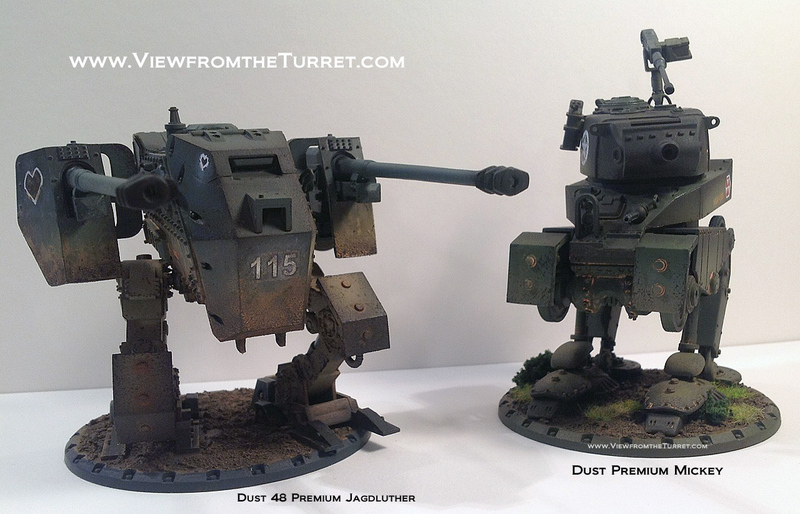 These two walkers are from the Dust Premium line. Both are stock out of the box with the exception that I textured and painted the bases. But nothing was done to the walkers themselves. 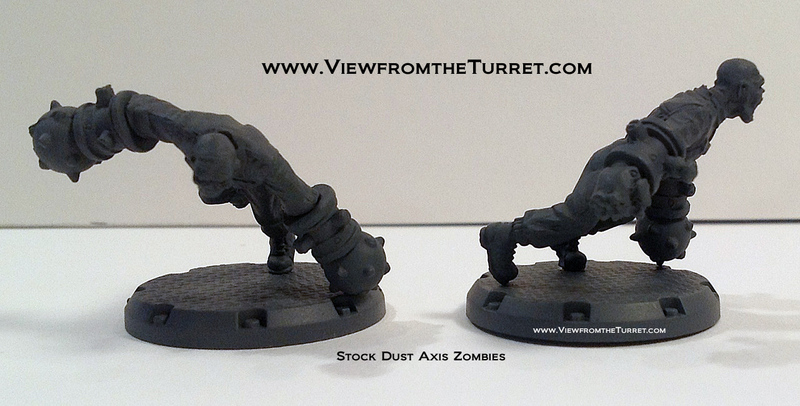 Dust Axis Zombies as they come out of the box. These are the most ‘bendy’ of the figures we have seen so far. But they are durable. All is not perfect. In the D6 Generation review Romeo remarked he thought the infantry were ‘gumbies’. For the most part we do not agree with this sentiment but there are a few figures were this is an accurate statement. As you can see by the photo of the Axis Zombies a couple of the figures are in rather gravity defying poses. These figures are very flexible but this also makes them durable. Unlike many of the 40K Tyranid models these won’t snap in play. Of course whether or not they will shed paint with regular use remains to be seen but we really don’t think so unless you really tend to mush them. Some of the other infantry figures are a touch bendy at the ankles as well but none to the extent of the Zombies (that we have seen anyway). Last, but certainly not least, the community support for Dust Warfare has been outstanding. The FFG Dust Warfare forum is a useful and civil place to get help and support for Dust Warfare. And the work by both Rodney and Craig has really been outstanding. The new Unit Forward site is looking very nice. The Beasts of War and BattleTactics.tv are ramping up their coverage as well. It is always helpful to get into a game when there is an active community behind it. So, overall, while we would still have preferred the game in 15mm scale we will take it as it is. The combination of the great rules and the miniatures were enough to pull us back into 28mm once again. And the journey has been a whole lot of fun! Also see the Dust Warfare — August 2012 Update. This entry was posted in 28mm, Dust Warfare, Miniature Wargames, Painting, Sci-Fi, WW2.